Being politically correct has made it difficult to have the important conversations this country needs to have. Because it is politically incorrect to criticize Israel, the US has failed to broker peace between Israel and Palestine. Because it is politically incorrect to talk about race and the achievement gap, the country has not done enough to close the gap between minorities and whites. And now, because any criticism of America’s gun rights is politically incorrect to discuss because it labels you as an unpatriotic American, this country isn’t having the crucial conversation we need to have about guns. Being politically correct has cost many people their lives, the latest which we’ve seen in Aurora, Colorado. It’s time we had that conversation. While I, like many other Americans on July 20th, was watching the stellar premier of the Batman Trilogy the Dark Knight Rises, it became the darkest night for the lives of decades of movie-goers in the small town of Aurora. For many of them it was their last. Twenty-four year old James Holmes snuck into the theater from the back exit dressed like the Antagonist of the film, Bane, in black, wearing a gas mask and a bullet-proof vest, and leggings, ballistic helmet, groin and throat protector and tactical gloves. He started the attack by throwing a canister that exploded with smoke to blind the audience. He fired his 12-gauge Remington 870 Express Tactical shotgun, then his Smith & Wesson M&P15 semi-automatic rifle with a 100 round drum magazine, and lastly his .40 caliber glock 22 handgun. He obtained the 3 guns and almost 7,000 rounds of ammunition fully within the law. Holmes killed 12 movie-goers that night, and injured over 50 others, many who remain in the hospital for gun-shot wounds. Many of those killed died in a last act of heroism, like Jon Blunk, Matt McQuinn and Alex Teves who shielded their girlfriends from the gunshots. Six year old Veronica Moser Sullivan was the youngest victim, her mother remains in the hospital unaware of her death and just recently had a miscarriage. 24 year old Jessica Ghawi died after just surviving a shooting at a Toronto Mall. The majority of the victims were in their twenties, around the same age as the shooter. Mass murders by gun is not anything new to the United States, although it is unique to the United States. On average, the US faces nearly 20 mass shootings. The deadliest incidents range from the 32 killed at Virginia Tech in 1999, to 23 killed in Luby’s Cafeteria in Texas in 1991, to the 21 shot dead at a California McDonald’s in 1984. Just last year the Tuscon shooting and attempted assassination of Congresswoman Gabrielle Giffords wound up with 6 Americans dead. Despite the high rate of mass shootings in the US, obviously not enough has been done to address the gun issue in this country. Despite the high rate, the support for stricter gun control has declined as gun rights has become an untouchable topic. There are many lessons we can learn from the Aurora massacre. For one, how could someone purchase so many guns and bullets in such a short amount of time while not raising suspicion to any authority? Holmes purchased 4 guns in just 2 months. 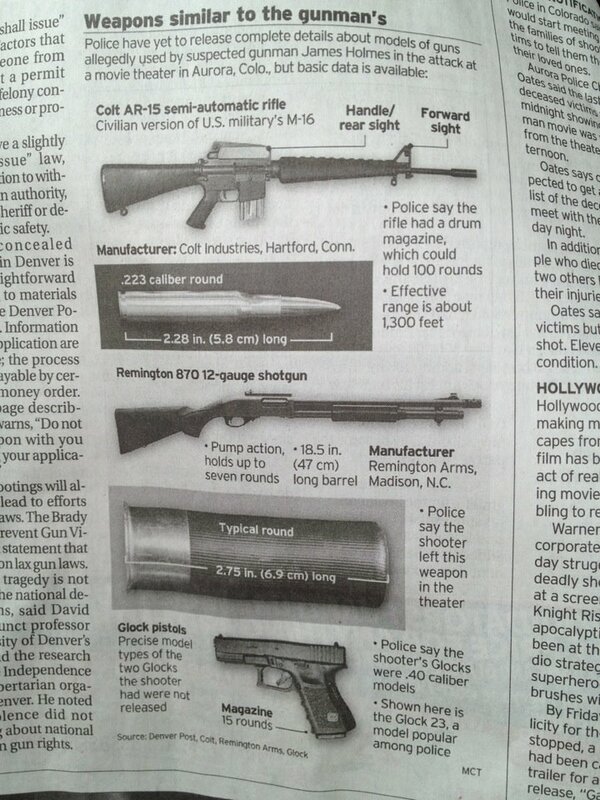 In addition, he purchased a 100 round drum magazine that if had not jammed, could have killed many more. The magazine is set to be phased out, but unfortunately Holmes was able to get a hold of one before it did. The 6,000+ bullets were all purchased online, fully within the law. He was also able to purchase the $300 worth of protection gear on the internet without question. 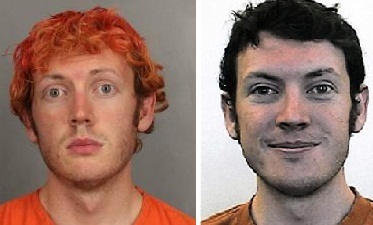 That wasn’t the only warning sign that James Holmes was scheming something. Two weeks before the shooting, Holmes sent a mysterious package to his university that actually led to an evacuation of the building. It was then immediately turned over to investigators who failed to act after discovering the contents of the package–a notebook with detailed description and illustration of Holmes plans to kill a mass amount of people. Prior to the package being sent, it was just revealed today that a University of Colorado psychiatrist notified campus police because she was so alarmed by Holmes’ behavior and believed he was a threat. However, campus authority decided not to do anything because Holmes was dropping out of the university anyway. Were there not enough warning signs to stop this mass killer? If someone had spoken up early on, or inquired to local authorities about Holmes’ suspicious behavior then he would have been stopped before he had the ability to enter the theater that midnight. Better yet, even if Holmes slipped through the cracks of the university and local authority, if Holmes didn’t have the ability to buy all the ammunition and weapons without raising attention from anyone, he wouldn’t have been able to execute his plan. If Holmes was actually engaging in illegal behavior prior to the shooting, then it would have been much more likely that he would be stopped. Unfortunately within our current gun laws, the reason why no one could foresee what was happening is because it was all fully within the law. President Obama, the Democrat candidate and the expected politician to take issue with the lax gun laws in this country has done nothing. One of the first thing his close Aid John Brennan responding on his behalf remarked to reporters is that “the president believes we need to take common sense measures that protect the Second Amendment”. The President himself said in a later speech in Aurora that “AK-47s belong in the hands of soldiers, not in the hands of criminals”. That’s common sense even among Republicans. The only problem with that statement is that Holmes was not a convicted criminal prior to the shootings, so an AK-47 in the hands of Holmes was entirely within his legal rights. Obama isn’t expected to do anything about gun control while he runs for a 2nd term. Guns in the US is a sensitive subject, that even the Noble Peace Prize Laureate for advocating for a world without nuclear weapons, cannot address. There is a lot local authority, and universities can learn from the Aurora shootings. But this country as a whole also needs to learn that threats to our lives don’t only come from foreign extremists or nuclear weapons. If Holmes was Muslim, the police would have stopped him a long time ago. The massacre in Aurora is a reminder that the worst terror is what we can’t see, and that the weapons of mass destruction we sought so hard to find for for years isn’t in Iraq, Iran, or Syria. Indeed, guns have killed more people in the United States than any foreign terrorist attack. It’s time we put an equal effort into curbing violence inside the United States–and stricter gun controls is a start.